A 72 year-old male with a history of hypertension and hiatal hernia presents to the emergency department with one week of generalized weakness. His family report decreased oral intake with frequent emesis over the past four days. He denies chest pain, shortness of breath, abdominal pain, or other complaints. During the interview he has a generalized tonic-clonic seizure which persists for five minutes despite the administration of 4mg of lorazepam. 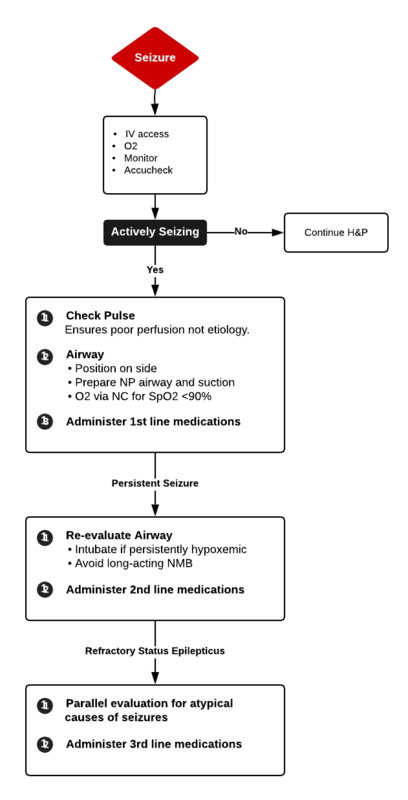 The management of active seizures is algorithmic, starting with a rapid assessment of airway patency, supporting ventilation (with appropriate positioning, nasopharyngeal airway adjuncts and bag-valve mask if needed) and ensuring adequate perfusion. Patients should have continuous vital sign monitoring, supplemental oxygen to maintain oxygen saturation >92% and intravenous access1. 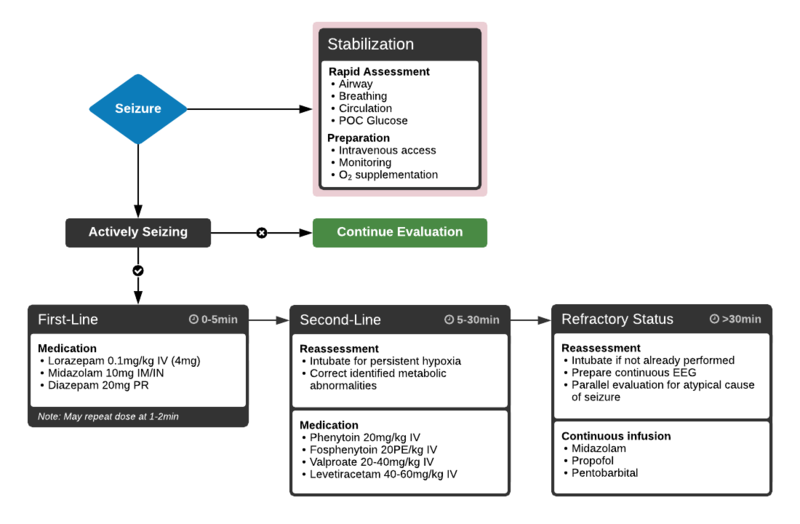 Pharmacologic treatment follows a stepwise approach, detailed in the algorithm below. The focus is on immediate stabilization and progressively escalating anti-epileptic drugs eventually requiring endotracheal intubation and continuous infusions of sedatives2-4. Seizures are caused by excessive and disorganized neuronal activation, typically induced by global alterations in the production and transmission of impulses (electrolyte derangements, drugs/toxins, infection), or foci of increased irritability (hemorrhage, stroke, mass) – a pathophysiologic motif that mimics cardiac tachyarrhythmias (sympathomimetic toxicity or scarred myocardium for example)1. Status epilepticus, defined as a seizure lasting greater than five minutes or recurrent seizures without a return to normal baseline, shares an equally high short-term mortality – greater than 20%5. The algorithm below details historical and examination features that may assist with distinguishing epileptic seizure from non-epileptic activity6,7. The patient continued to seize and a point-of-care chemistry panel revealed a serum sodium of 108mEq/L. Seizures abate after the infusion of hypertonic saline (100mL of 3% saline over 10 minutes, repeated until cessation of seizures). While hyponatremia is generally corrected slowly – owing to the risk of osmotic demyelination – immediate correction in this setting is critical8. The remainder of the patient’s evaluation demonstrated urine osmolarity is 389mOsm/kg and urine sodium is 53mmol/L, in the setting of relative euvolemia on examination these findings were consistent with SIADH. 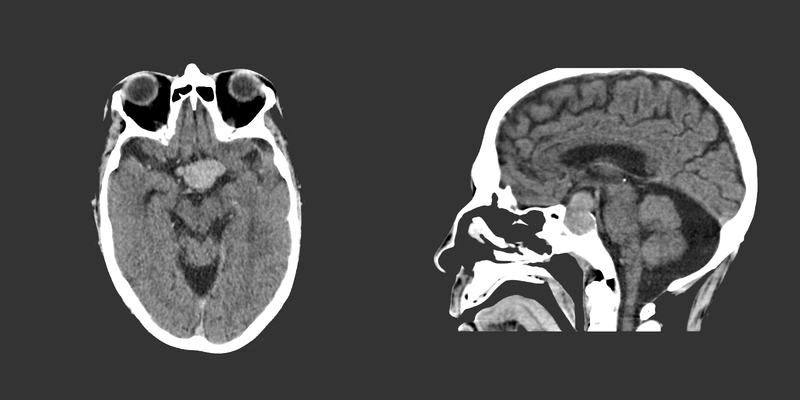 Head computed tomography is obtained and reveals a sellar mass. McMullan JT, Davitt AM, Pollack CV Jr. Seizures. In: Rosen’s Emergency Medicine. Mosby Incorporated; 2002:2808. doi:10.1016/S1474-4422(06)70350-7. Billington M, Kandalaft OR, Aisiku IP. 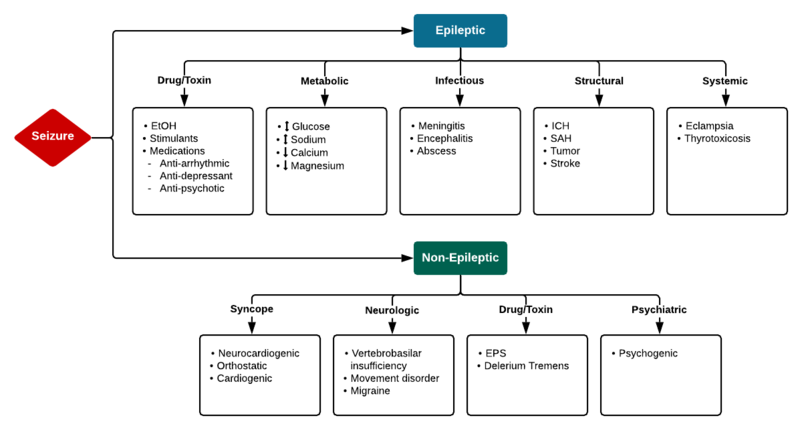 Adult Status Epilepticus: A Review of the Prehospital and Emergency Department Management. J Clin Med. 2016;5(9):74. doi:10.3390/jcm5090074. Huff JS, Morris DL, Kothari RU, Gibbs MA, Emergency Medicine Seizure Study Group. Emergency department management of patients with seizures: a multicenter study. Academic Emergency Medicine. 2001;8(6):622-628. Prasad M, Krishnan PR, Sequeira R, Al-Roomi K. Anticonvulsant therapy for status epilepticus. Prasad M, ed. Cochrane Database Syst Rev. 2014;16(9):CD003723. doi:10.1002/14651858.CD003723.pub3. Logroscino G, Hesdorffer DC, Cascino G, Annegers JF, Hauser WA. Short-term mortality after a first episode of status epilepticus. Epilepsia. 1997;38(12):1344-1349. Sheldon R, Rose S, Ritchie D, et al. 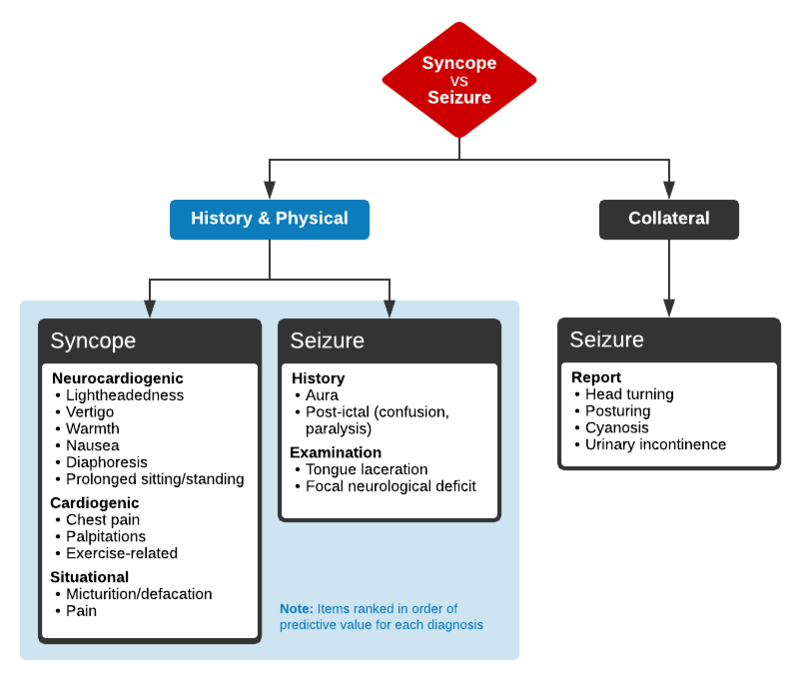 Historical criteria that distinguish syncope from seizures. J Am Coll Cardiol. 2002;40(1):142-148. McKeon A, Vaughan C, Delanty N. Seizure versus syncope. Lancet Neurol. 2006;5(2):171-180. doi:10.1016/S1474-4422(06)70350-7. Goh KP. Management of hyponatremia. Am Fam Physician. 2004;69(10):2387-2394. ALCAPA (anomalous origin of the left coronary artery from the pulmonary artery): coronary artery arises anomalously from the pulmonary artery; as pulmonary arterial pressure falls during the first 6 months of infancy, prograde flow through the left coronary artery ceases and may even reverse. O’Connor M, McDaniel N, Brady WJ. The pediatric electrocardiogram. Part I: Age-related interpretation. Am J Emerg Med. 2008;26(2):221-228. doi:10.1016/j.ajem.2007.08.003. Goodacre S, McLeod K. ABC of clinical electrocardiography: Paediatric electrocardiography. BMJ. 2002;324(7350):1382-1385. O’Connor M, McDaniel N, Brady WJ. 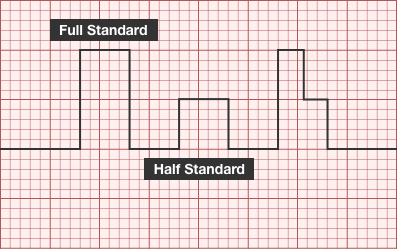 The pediatric electrocardiogram Part II: Dysrhythmias. Am J Emerg Med. 2008;26(3):348-358. doi:10.1016/j.ajem.2007.07.034. O’Connor M, McDaniel N, Brady WJ. The pediatric electrocardiogram Part III: Congenital heart disease and other cardiac syndromes. Am J Emerg Med. 2008;26(4):497-503. doi:10.1016/j.ajem.2007.08.004. Schwartz P. Guidelines for the interpretation of the neonatal electrocardiogram. Eur Heart J. 2002;23(17):1329-1344. doi:10.1053/euhj.2002.3274. 64M with a history of HFrEF (LVEF 20-25%), CAD, AICD (unknown indication), COPD, CKD III presenting with gradual onset shortness of breath, progressive bilateral lower extremity edema. Examination consistent with severe acute decompensated heart failure presumed secondary to left ventricular dysfunction. Telemetry monitoring with multiple episodes of nonsustained ventricular tachycardia. In the ED, the patient developed worsening respiratory failure despite initiation of therapy, requiring endotracheal intubation. Continuous cardiac monitoring revealed persistent salvos of NSVT, progressing to slow ventricular tachycardia without device intervention. Device interrogation revealed multiple events, 3 shocks, several ATP’s over the recorded period. 31F with autoimmune polyglandular syndrome (adrenal, thyroid and endocrine pancreatic insufficiency), presenting with fever and cough. Evaluation consistent with sepsis presumed secondary to pulmonary source. 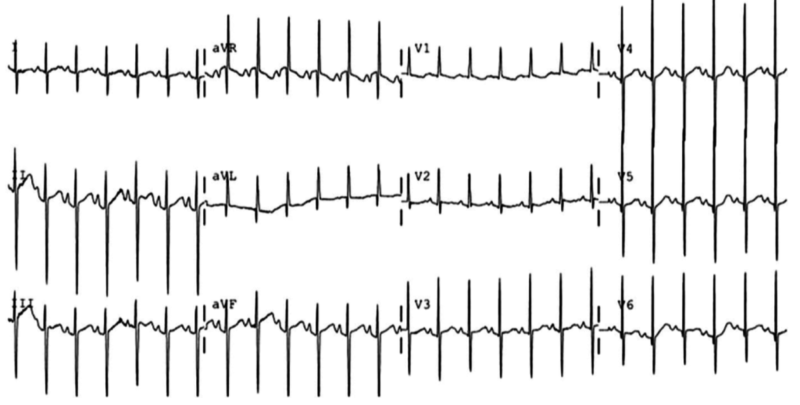 Telemetry monitoring initially with ventricular bigeminy, then nonsustained ventricular tachycardia. In the ED, the patient developed pulseless ventricular tachycardia – apparently polymorphic. Chest compressions and epinephrine produced return of spontaneous circulation with recovery to baseline neurologic function. ECG revealed prolonged QTc and chemistry panel notable for critical hypokalemia/hypomagnesemia. Initially attributed to electrolyte disturbances. 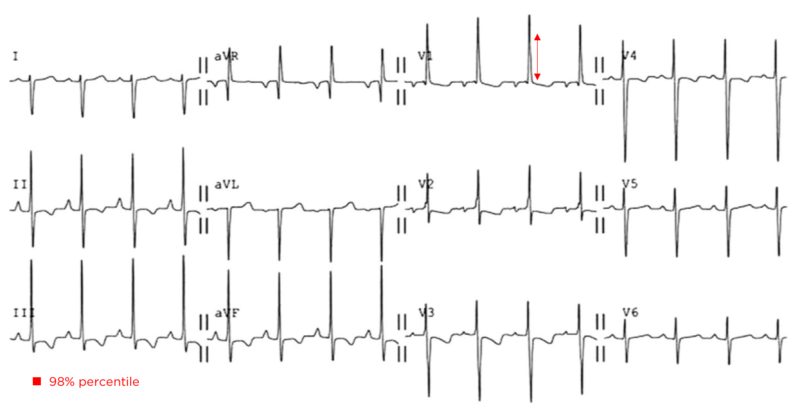 However, serial ECG’s continued to show prolonged QTc (possibly acquired, home medications included metoclopramide and erythromycin). Early echocardiography demonstrated global hypokinesis with EF 30-35% attributed to severe sepsis and recurrent defibrillation. Cardiac CT after resolution of acute illness showed persistently depressed ejection fraction without coronary atherosclerosis. The presence of NICM associated with malignant dysrhythmias warranted ICD placement. No evidence that NSVT is an independent predictor of SCD. 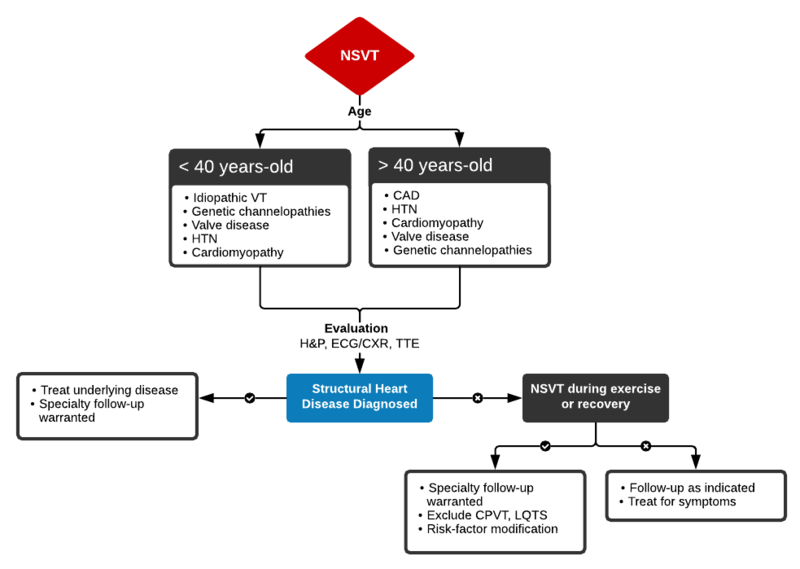 NSVT <24h after admission for NSTEMI/STEMI not of prognostic significance. Zipes DP, Camm AJ, Borggrefe M, et al. ACC/AHA/ESC 2006 guidelines for management of patients with ventricular arrhythmias and the prevention of sudden cardiac death–executive summary: A report of the American College of Cardiology/American Heart Association Task Force and the European Society of Cardiology Committee for Practice Guidelines (Writing Committee to Develop Guidelines for Management of Patients with Ventricular Arrhythmias and the Prevention of Sudden Cardiac Death) Developed in collaboration with the European Heart Rhythm Association and the Heart Rhythm Society. Eur Heart J. 2006;27(17):2099–2140. doi:10.1093/eurheartj/ehl199. Higham PD, Adams PC, Murray A, Campbell RW. Plasma potassium, serum magnesium and ventricular fibrillation: a prospective study. Q J Med. 1993;86(9):609–617. Katritsis DG, Zareba W, Camm AJ. Nonsustained ventricular tachycardia. J Am Coll Cardiol. 2012;60(20):1993–2004. doi:10.1016/j.jacc.2011.12.063. Katritsis DG, Camm AJ. Nonsustained ventricular tachycardia: where do we stand? Eur Heart J. 2004;25(13):1093–1099. doi:10.1016/j.ehj.2004.03.022. Wellens HJ. 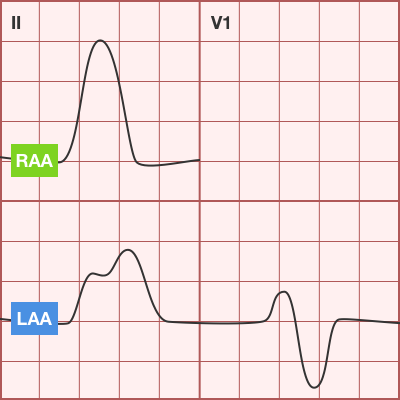 Electrophysiology: Ventricular tachycardia: diagnosis of broad QRS complex tachycardia. Heart. 2001;86(5):579–585. Buxton AE, Lee KL, Fisher JD, Josephson ME, Prystowsky EN, Hafley G. A randomized study of the prevention of sudden death in patients with coronary artery disease. Multicenter Unsustained Tachycardia Trial Investigators. N Engl J Med. 1999;341(25):1882–1890. doi:10.1056/NEJM199912163412503. Jouven X, Zureik M, Desnos M, Courbon D, Ducimetière P. Long-term outcome in asymptomatic men with exercise-induced premature ventricular depolarizations. N Engl J Med. 2000;343(12):826–833. doi:10.1056/NEJM200009213431201. Udall JA, Ellestad MH. Predictive implications of ventricular premature contractions associated with treadmill stress testing. Circulation. 1977;56(6):985–989. Preliminary report: effect of encainide and flecainide on mortality in a randomized trial of arrhythmia suppression after myocardial infarction. The Cardiac Arrhythmia Suppression Trial (CAST) Investigators. N Engl J Med. 1989;321(6):406–412. doi:10.1056/NEJM198908103210629. Goldstein S. Propranolol therapy in patients with acute myocardial infarction: the Beta-Blocker Heart Attack Trial. Circulation. 1983;67(6 Pt 2):I53–7. Moss AJ. MADIT-I and MADIT-II. J Cardiovasc Electrophysiol. 2003;14(9 Suppl):S96–8. Moss AJ, Hall WJ, Cannom DS, et al. Improved survival with an implanted defibrillator in patients with coronary disease at high risk for ventricular arrhythmia. Multicenter Automatic Defibrillator Implantation Trial Investigators. N Engl J Med. 1996;335(26):1933–1940. doi:10.1056/NEJM199612263352601. Bardy GH, Lee KL, Mark DB, et al. Amiodarone or an implantable cardioverter-defibrillator for congestive heart failure. N Engl J Med. 2005;352(3):225–237. doi:10.1056/NEJMoa043399. Secondary: Provoked, caused by trauma, illness, intoxication, metabolic disturbances, etc. De Lorenzo, R. (2013). Syncope. In Rosen’s Emergency Medicine – Concepts and Clinical Practice (8th ed., Vol. 1, pp. 135-141). Elsevier Health Sciences. A 50 year-old male with a reported two-year history of infrequent spells, presenting with two spells in the past two days. The patient’s spells began two years ago, he recounts that he was watching television when he lost consciousness and a friend noted he started shaking; he does not recall the event, and awoke in the hospital. The next spell occurred one year later, though the patient is unable to recall much about this episode. The patient remained spell-free until yesterday when he was on a bus, lost consciousness and awoke in a hospital. He notes that he had bit his tongue and lost control of his bladder. He was discharged hours later with a prescription for an AED which he was unable to fill. This morning, the patient had another spell while in the bathroom. His roommate heard him fall, found him on the ground, and noted that his mouth was moving but did not see any other movements. The patient’s episodes are all associated with loss of consciousness and are followed by 5-10 minutes of disorientation after which he recovers fully. The episodes are sometimes preceded by a feeling of “euphoria”, though this feeling sometimes occurs without subsequent LOC. The patient denies any associated palpitations, dizziness/LH, chest pain or muscle pain. He has not had any recent fevers/chills, dysuria, cough, headache, changes in vision, numbness/tingling, weakness, difficulty speaking or swallowing or weight loss. He also denies any history of head trauma. General: Well-appearing, pleasant, and in NAD. HEENT: NC/AT. MMM. Small lesion on tongue. CV: RRR with occasional ectopic beats, no M/R/G. Abdomen: S/NT/ND. Bowel sounds present. 50 year-old male with a history of HTN and a reported two-year history of infrequent spells presenting with two spells in the past two days. The description of the patient’s episodes could be consistent with seizures. 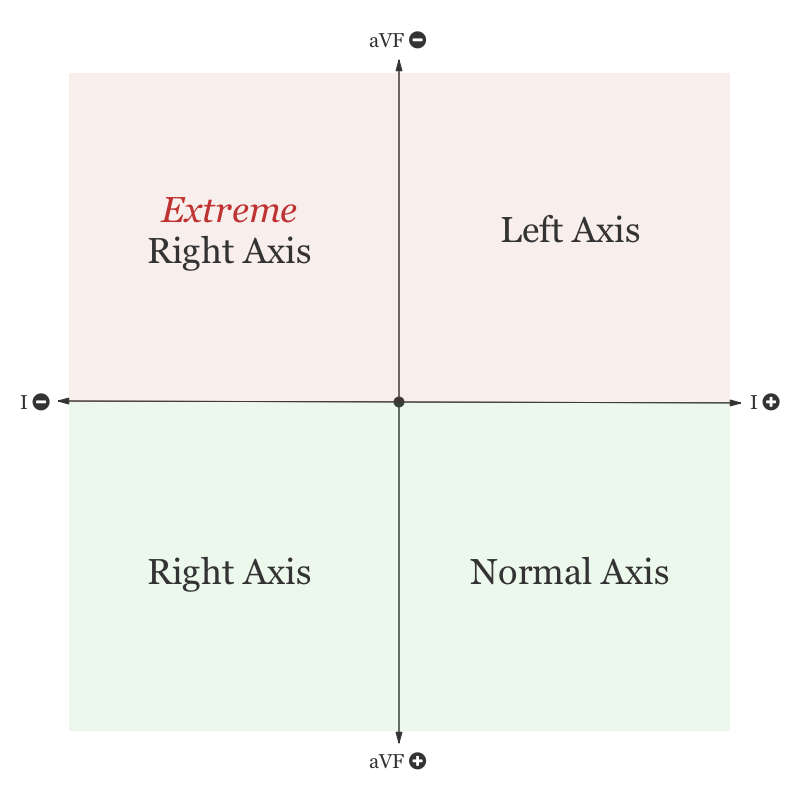 Aspects supporting this notion include loss of consciousness and period of confusion following each episode. One of the recent episodes was also associated with tongue-biting and loss of bladder control. Additionally, some episodes are associated with a sensation of euphoria rising from the abdomen to the head which could be indicative of an aura. Characteristics that suggest other causes include the absence of noted convulsions and non-stereotyped nature of each episode which could be due to the patient’s poor recollection of these events and absence of reliable witnesses. In the case of true seizures, the possible etiologies in this patient include a mass, metabolic abnormalities, substance use, or concomitant infection exacerbating an existing propensity for seizure activity. Other, non-seizure causes warranting evaluation include cardiogenic syncope particularly given the evidence of ectopic beats on examination and electrocardiogram. First, is it syncope? History is very important for distinguishing syncope from other causes (seizure, dizziness, vertigo, presyncope). Ask about precipitating events, prodromal symptoms, post-ictal confusion. 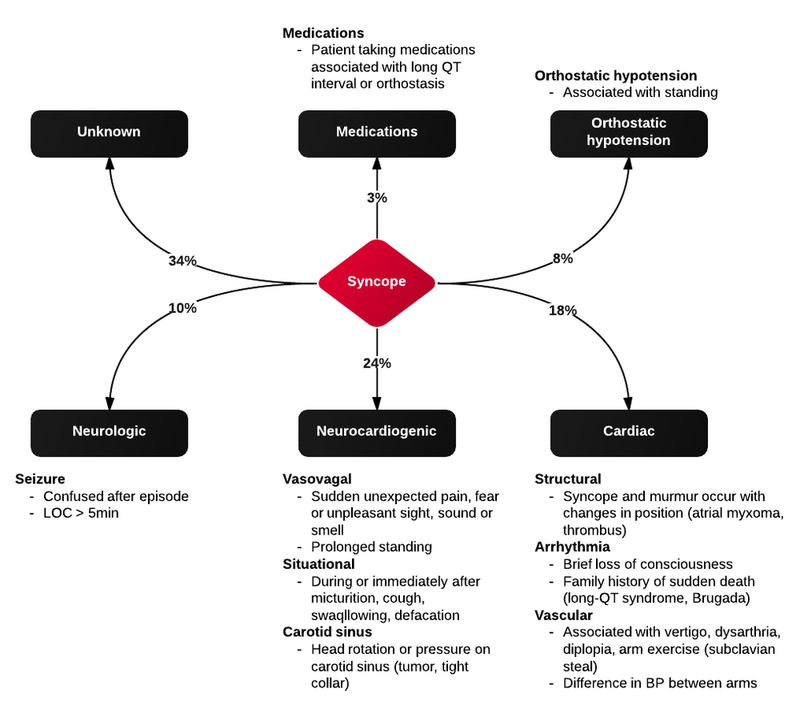 Common causes of syncope and their associated symptoms are detailed in the figure below.